" It was previously operated up to 7 PM, and today it will be extended up to 10 PM for one month ahead"
City-owned bus operator PT Transportasi Jakarta (Transjakarta) President Director, Budi Kaliwono disclosed, starting today, the operational of corridor 13 (Kapten Tendean-Ciledug) is extended up to 10 PM. This trial will be applied for one month. It is also coupled with the additional bus and human resources (HR) to provide the best service to all passengers. "It was previously operated up to 7 PM, and today it will be extended up to 10 PM for one month ahead," he expressed, Wednesday (4/11). To give more lighting power along 9.4 km of the lane, the lighting car escorting the bus during operation has been deployed. One car has two officers to support the service time. 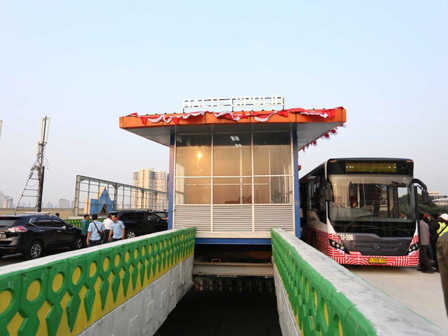 It is mechanically applied while awaiting the completion of supporting facilities along the Transjakarta lane. He added this idea is a follow-up of Jakarta Deputy Governor's instruction to Transjakarta to find a solution to the service scheme of corridor 13 at night. Additionally, the addition of operating hours is also an effort to meet customer demand. "This is because every day the bus serves 15,000 for corridor 13 with routes Blok M-Ciledug, Pancoran Barat-Ciledug, Tosari-Ciledug and Ragunan-Ciledug," he stated.